This is the time of year when bears leave the forest in Washington state and move into neighborhoods looking for food. The cub barely noticed the nearby fruit trees and took the plunge. He lumbered out of the pool, shook himself off and made his way back into the woods. 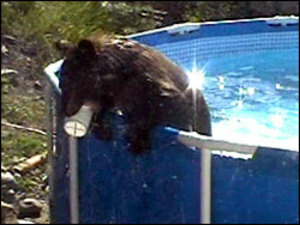 The pool owner drained the pool the next day, and no one has seen neither hide nor hair of the bear since. Talk Like a Pirate Day is tomorrow. 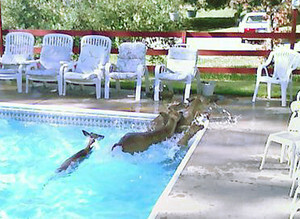 There are many optical illusions out there, but this is a great example of an illusion used as a pool decoration. Freshome has found several photos of similar illusion s. What would you want painted on the bottom of your pool? Giant tortoise? Shark? Scuba diver? 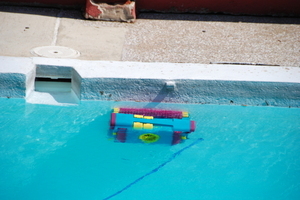 Here are many, many ideas for saving your cell phone after you fish it out of the pool. Today I was using the skimmer net on the long pole pulling out the Sunday paper pages that had blown in. During this activity I dropped my phone in the pool. All of these people dripped their phones in the toilet! This guy dropped his in Gatorade and another down the disposal. Do pool filters need socks? They don't cost very much. A pack of five filter socks is under $10. As we continue to expand our knowledge of pool maintenance, we learn about the many products intended to help us do the job. Now there is a sock on our filter and it is trapping some of the debris that would have gone directly to the big DE filter at the pump. Hurricane Dean is filling our pool. Rick came over with a helper to power wash the deck and tackle some other odd jobs. He has a Maytronics Dolphin Deluxe that he kept running in our pool the entire day, so that debris from the power-wash project did not accumulate in the pool. Watching the Dolphin chug along leisurely throughout the day, making the water cleaner and taking some of the workload from the filter, made us think that this might be a good summer present for our pool -- and for the normal maintenance crew.